“The ‘miracle’ of cooperation is a team strategy that opens a gap in the wall of an indifferent crowd that excludes the weakest.” Those were Pope Francis’ words on Saturday to 7,000 members of the Confederation of Italian Cooperatives, on the 100th anniversary of its foundation. The Pope told the Confederation in the Paul VI Hall on Saturday that its cooperative model, corrects certain tendencies associated with collectivism and statism, which at times are lethal to private initiative; and at the same time, it curbs the temptations of individualism and selfishness associated with liberalism. The reason for this, the Pope pointed out, is because it’s a model “inspired by the social doctrine of the Church”. The Holy See Press Office gives details of Pope Francis’ meeting with the President of the Republic of South Sudan in the Vatican. Before the recitation of the Marian prayer, the Pope contemplates the events of the Transfiguration on this second Sunday of Lent. Reflecting on the Gospel of St Luke, in which the Evangelist vividly recounts Jesus transfigured on the mountain, the Pope said, that this was ”a place of light, a fascinating symbol of the unique experience reserved for the three disciples”, Peter, James and John. The Transfiguration, explained the Pope, “takes place at a very precise moment of Christ's mission, that is, after he confided to his disciples that he "must suffer much, [...] be killed and rise again on the third day" (v. 21). ROME - As he announced he would do after he was convicted of covering up sexual abuse committed by a priest, French Cardinal Philippe Barbarin of Lyon met Pope Francis March 18 to hand in his resignation. ROME - French Cardinal Philippe Barbarin of Lyon said Pope Francis would not accept his resignation following his conviction for covering up clerical sexual abuse, so he has decided to step aside temporarily for the good of the archdiocese. In a statement published by the Archdiocese of Lyon March 19, Barbarin said Francis, “invoking the presumption of innocence,” declined to accept his resignation. The cardinal’s lawyers have filed an appeal of the conviction, which was handed down March 7 by a French court. 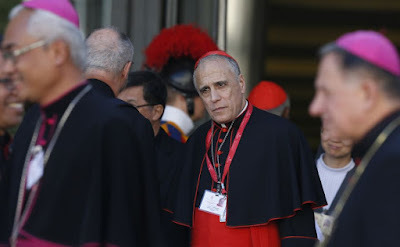 At the same time, the cardinal said, Francis told him to do whatever he felt necessary for the good of the archdiocese. Happy Feast Day, Pope Emeritus Benedict XVI (Joseph Ratzinger)! “God is not ambiguous, He is not hidden behind riddles, He has not planned the future of the world in an indecipherable manner.” In his catechesis on the third petition of the “Our Father”, Pope Francis said that we can see the will of the Father expressed in the words of Jesus: God wills “to seek and to save that which was lost”. This, the Pope said, “without any shadow of doubt, is the will of God: the salvation of all human beings”, of each one of us individually. An amount has been sent on behalf of Pope Francis to the people hit by the devastation caused by cyclone Idai[/color.